Beyond the lush green meadows of Kashmir lies a world where the horizon is seam with clear blue sky and hulking high snow capped peaks. It reaches the eyes of thrill-seekers who mark their destiny and bump off the rugged terrain to accomplish their climbing expedition in Kashmir. 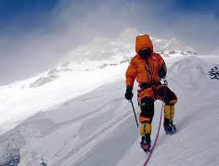 Surrounded by the Pirpanjal Range and the Himalaya that houses several peaks, mountain climbing in Kashmir has won the hearts and pedes of global mountaineers. Passing through the gentle meadows and crossing several streams, the tracks suddenly finds its way to a rocky terrain and further winds up to narrow tracks till a climber draws off a steep climb to reach the summit. Thus climbing in Kashmir is not an easy task as it requires resourcefulness when confronting adversities, fitness and a lot of patience on the part of the climber. Further special permits are required from the Indian Government via the Indian Mountaineering Foundation before one can go for climbing in Kashmir. Kashmir is no doubt a unique opportunity to explore the vast terrain secluded within the Indian Himalaya and Pirpanjal Range. It has some of the best mountain ranges and peaks that arrest the mind of mountaineers. Climbing in Kashmir from Kishtwar takes one to climb up to the summits of Tupendo and Cerro Kistwar peak. Other peaks in this belt are the Sickle Moon at 6,574 meters, Cathedral at 5,370 meters, Namtse at 6,000 meters, Brammah I and II at 6,416 and 6,425 meters respectively, Crooked Finger at 5,630 meters, and more. Set in the Pirpanjal Range, the Sunset Peak is a notable peak climbing expedition in Kashmir. Further, for amateur mountain climbers, the Harmukh and Tattakuti and several smaller peaks at an elevation of 5,000 meters in Sonamarg and Pahalgam are the ideal ones. Nonetheless, mountain climbing in Kashmir requires heavy preparations and the best time to hit such expeditions is during the summer season.